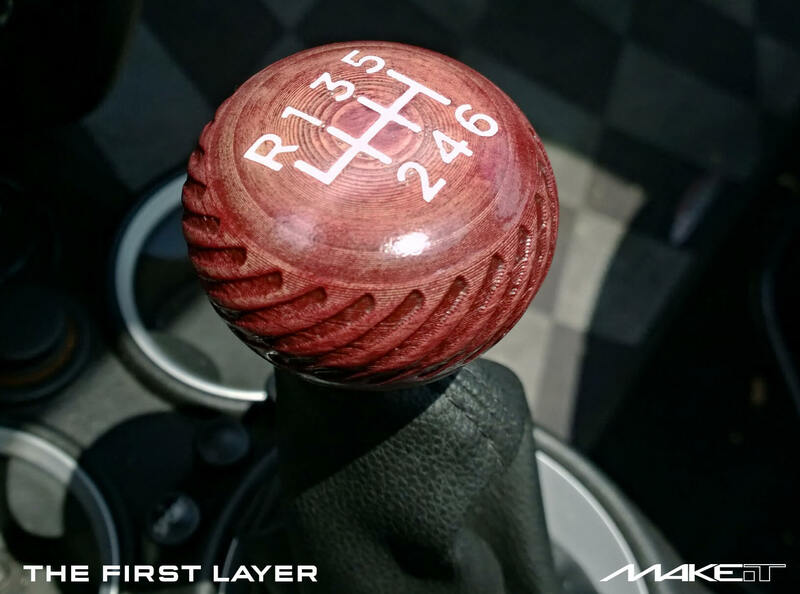 The First Layer: 3D Printed Shift Knob Wood Finishing Technique | Makeit, Inc. 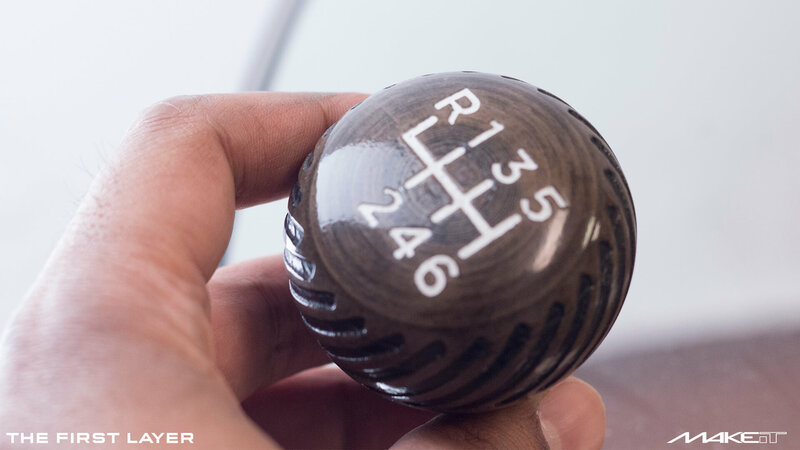 In part 2 of 2 from the 3D printed shift knob project, I’ll go over the basics of how to achieve this kind of beautiful wood-like finish effect and a simple way to get inlaid lettering. I have tried this process with a few brands of wood type filaments, and so far I have found Hatchbox’s variation to be quite reliable and to accept the stain very evenly. I’ve found that with most fill-type materials, changing the nozzle out from the standard 0.4mm up to a 0.5 or 0.6mm diameter helps reliability considerably. You can see below how rough the part is coming straight off the printer, but this was done intentionally to serve part of the finishing process. Getting a nicely variegated coloration requires having lots of nooks and crannies to fill with the wood stain. I setup this print in Simplify3D and used multiple processes to adjust settings mid-print. 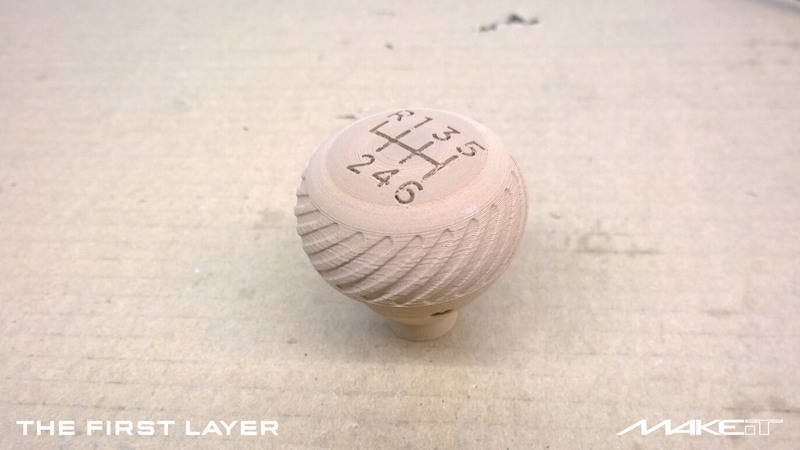 If you look carefully above the grooves on the side of the knob you’ll notice the layer resolution increases significantly, when in fact the layer resolution for this print had 16 distinct shifts jumping between 0.35 mm at the largest all the way down to 0.075 mm for the very topmost surface. This works double duty, both allowing me to speed up the print time by only using finest layers on the shallowest incline surfaces and creating a more natural looking final result. For the stain any typical water-based wood stain should work. Avoid using one-part stain and finish combinations as they tend to cover too evenly and don’t create the kind of variation you’d see with natural wood. Using a rag or paper towel saturate the part with stain and allow it to sit for 5-10 minutes, then wipe clean of excess that has not been absorbed. It may take up to a few hours before the stain is dry enough to sand effectively. 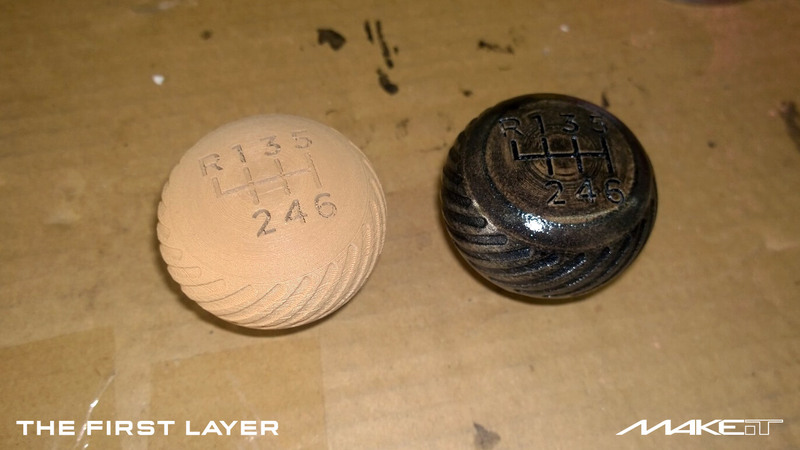 You can see below what the knob looks like after just one round of stain. After staining the part it’s time to go at with sand paper. This is a delicate process as it’s very easy to go straight through the stain if you sand too much in one area. If you completely smooth out the part at this point you will lose the cracks in layer lines that create the grain-like effect so it’s important not to go too far. The wood filament sands quite nicely, almost like working with a very hard natural wood. Below you can see the result of going back and forth between coats of stain and rounds of sanding about 3 times. Once I got nicely variegated color all around the knob it’s time to seal it in. For this I used spray-on shellac, however this part of the process might work better with a small can of shellac to dip the part into. You want to get a very thick covering of shellac so it might take as many as 6-7 coats. With a thick enough coating of shellac you can sand the part once more to get a glossy smooth surface without losing the color quality beneath. This will also protect the coloring from the inlay material that goes in next, and the shellac gives a nice yellow warmth to the coloring that makes it appear more natural. You can see above how much of a difference the wood stain makes. There really isn’t much left from the original coloring of the filament but you can see how it shows through to create the variegated effect. Next up is getting the letters to really pop with the contrast inlay. For this I used basic wood filler material, in this case Plastic Wood brand, in pure white. Use an old business card or similar to squeeze the wood filler down into the deboss for the letters and allow it to set for a few minutes, then rub away the excess with a damp paper towel. Because the lettering on this part is deep it’s a good idea to do the filler in multiple rounds so it can dry evenly. Once the wood filler is completely dry and the excess has been removed, it’s time for the final clear coat. 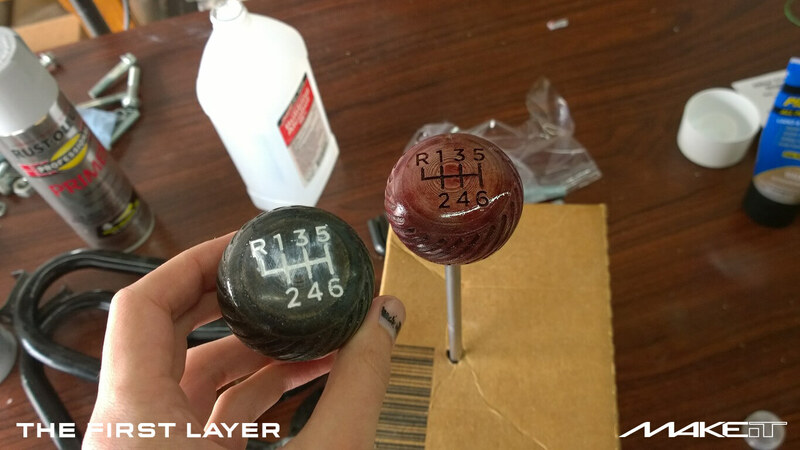 After a quick final round of sanding I sprayed the shift knob once more, this time with an enamel-type spray to get a much harder and shinier quality than the shellac underneath. 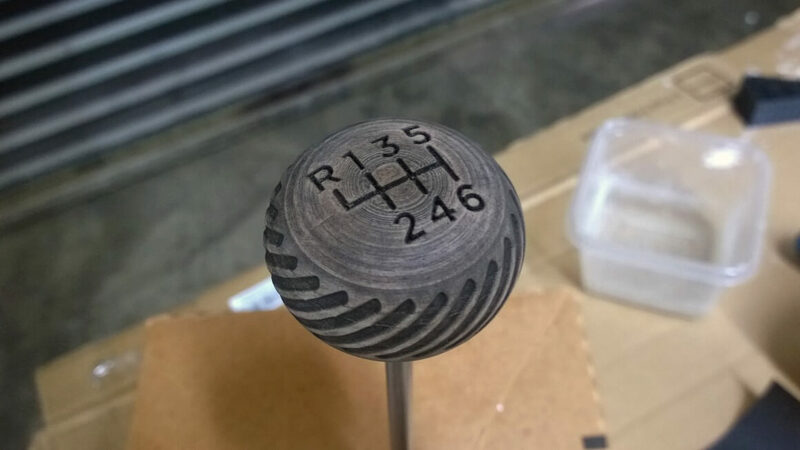 The final result is a truly unique shift knob that is as nice to use as it is to look at. 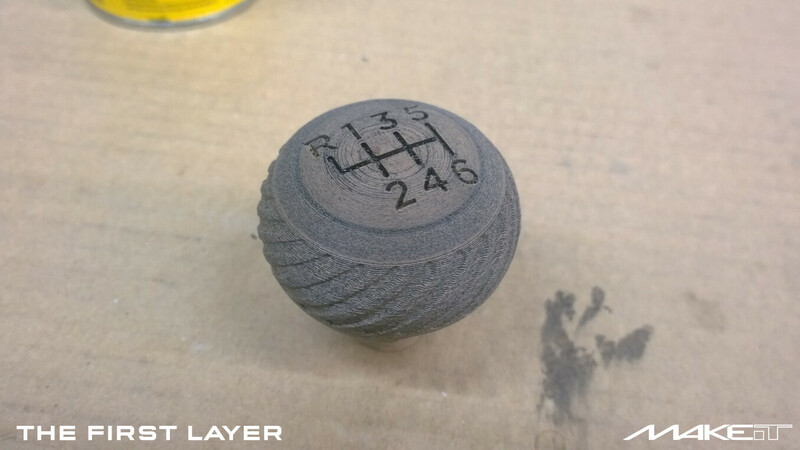 With three set screws tightened on the shifter shaft it’s as secure as the factory shift knob, and to date this customized part never fails to get compliments and surprised reactions when passengers learn that yes, it was actually 3D printed.